Models AVNN-1-C and AVNN-2-C provide 100 ps rise and fall times with output voltages variable to 5 Volts (Model AVNN-1-C) and 2 Volts (Model AVNN-2-C). The output duty cycle (relating pulse width and pulse period) is variable from 30% to 70% over the frequency range of 25 to 250 MHz yielding output pulse widths variable from 1 to 30 ns. At 25 MHz the units provide output pulse widths variable from 12 to 30 ns while at 250 MHz, the pulse widths are variable from 1 to 3 ns. The output pulse width and amplitude are both controlled by one-turn dials. 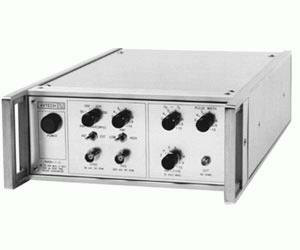 The pulse repetition frequency is variable from 25 MHz to 250 MHz using the internal clock oscillator that is controlled by a four-position front-panel switch and a one-turn fine control. A sync signal coincident with the main output is provided for oscilloscope triggering purposes. The units can also be triggered externally using a 0.3V RMS sine wave or a 50% duty cycle square wave. The propagation delay in the externally triggered mode is typically 5 ns. Both models feature an output DC offset or bias insertion function wherein the required DC offset or bias is applied directly to rear panel solder terminals. An available option provides an internally generated DC offset (0 to ± 5 Volts), which is controlled by a one-turn front panel control. A DC offset may be used to convert the AC-coupled bipolar output waveform to a unipolar output. Both models require 120/240V (switchable) 50-60 Hz prime power. The AVNN series is ideally suited for systems or laboratory applications such as logic family propagation testing, TDR, radar, optical and cable communications, SAW, nuclear, switching and propagation time studies and educational fields. In some cases, the specifications can be adapted to satisfy a particular requirement.